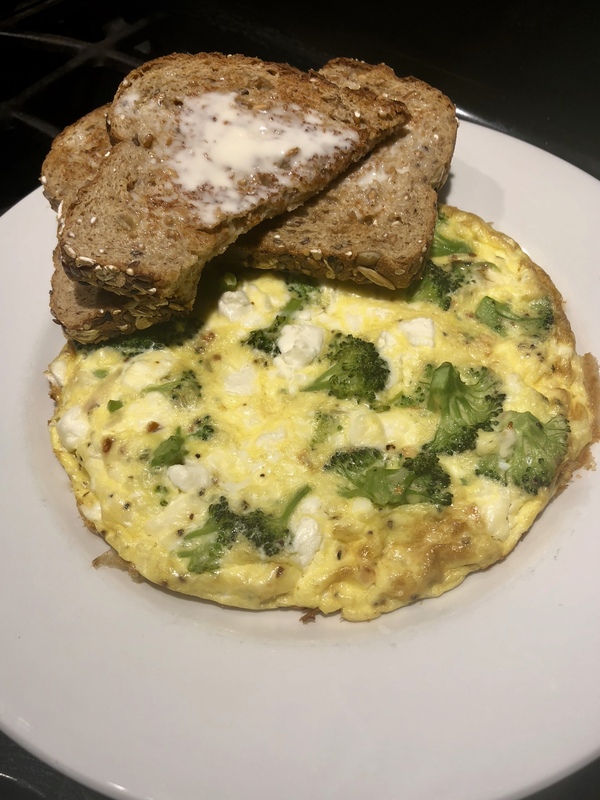 Broccoli and Feta Frittata with a stack of Dave’s Killer 21-grain Bread Toast and a Schmear of Butter. Here we go again! 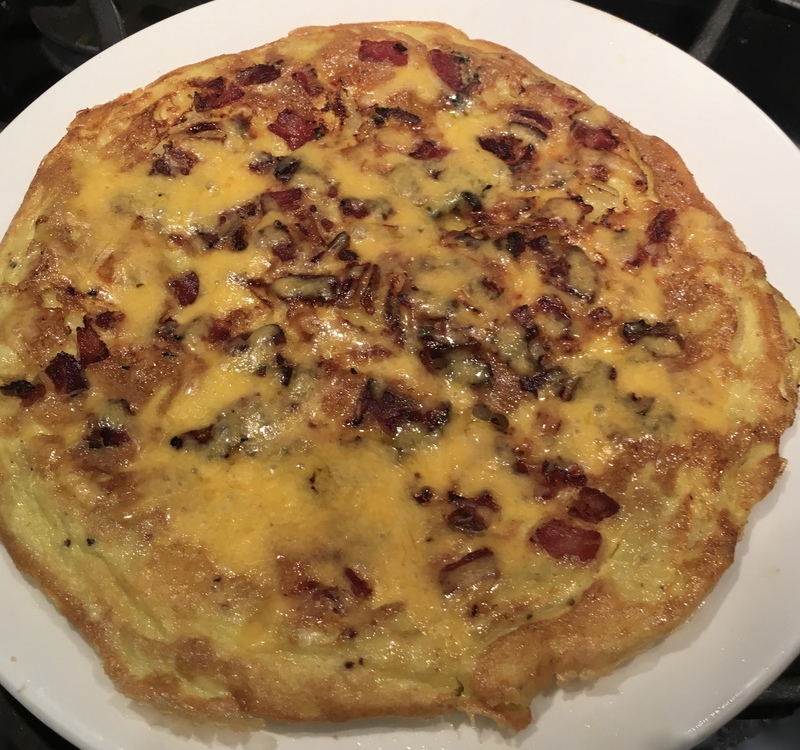 I did some browsing and found a good-sounding frittata that called for 8 eggs. That’s a lot for one guy at breakfast! 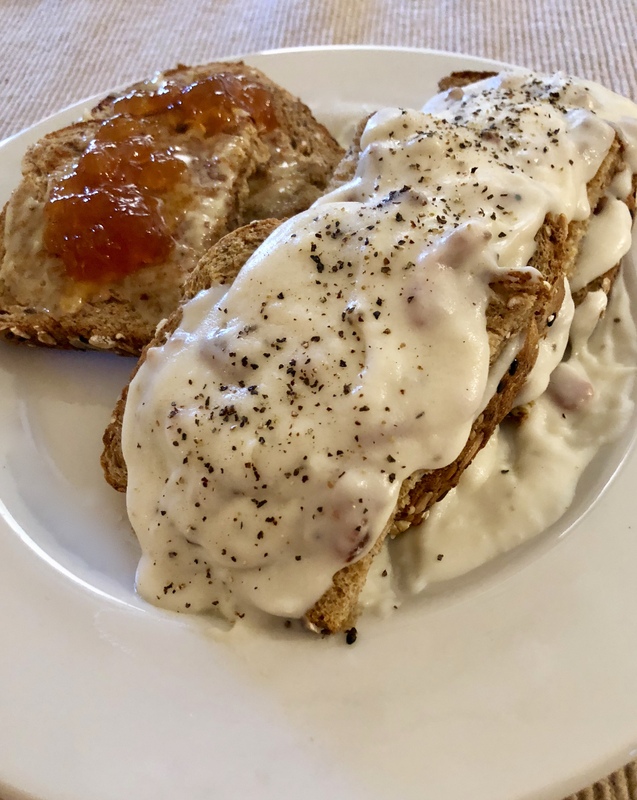 Here’s a version using most of the ingredients called for and to make recipe for cooking without a recipe for a great breakfast for one. With a side of fruit, it could easily become a breakfast for two. Do some elementary arithmetic and expand it for more if you want to impress folks. Heat broiler in oven with a rack about 4 inches below the flame. Melt butter in sauté pan on stovetop. Add onion and cook on medium temp for 3-4 minutes until soft. Add broccoli and cook about 6 minutes. The broccoli will turn a beautiful bright green and be tender but still have a little “tooth” to it. You can speed this up by adding a table spoon of water to the pan at a time and letting it steam and evaporate to help soften the onion and broccoli. While the onion and broccoli cook, beat the eggs until whites and yolks are well blended and stir in chile flakes and about 2/3 of the crumbled feta. Pour egg mixture over the broccoli and onion and stir to distribute broccoli and feta in the eggs. Let cook a couple of minutes to set the bottom of the eggs. Sprinkle remaining feta over the top. Transfer the pan to the oven and cook for 5 minutes, check frequently to see that the eggs have set and the sprinkled feta is lightly browned. Remove from oven, remembering the pan handle is very hot! Plate and enjoy. Non-paid testimonialI am a great fan of Dave’s Killer Bread 21-grain loaf. Great flavor and usually the only bread in my house. Read the package for the story behind it and the good things it makes happens for Dave’s employees. 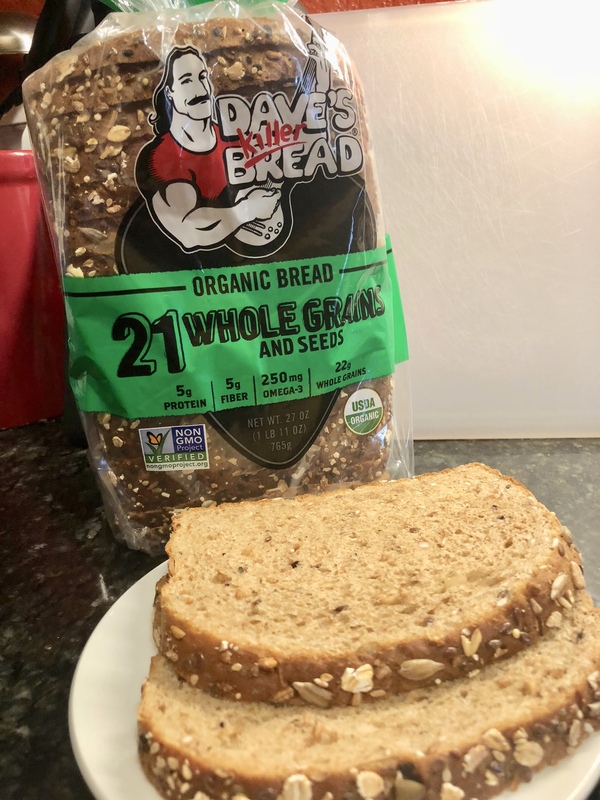 If you like it, buy two loaves in a bag at the big warehouse stores and save considerably over the price of one loaf at the chain grocery stores. I’ve been looking at a lot of “cooking for one” cookbooks and the all see to being with a chapter on how to stock a pantry and what kitchen gear one needs. I began this post with a list of equipment because of that influence. Surely your kitchen looks as much like the the kitchen store at the mall as mine and you don’t need a list of equipment. But, just in case, it is here this time. Savory, rich, sweet, tart and a hint of bitter make an individual breakfast pizza or supper. You can take a recipe for four and reduce it to a just-right serving for one or two. You can also play with it and have a good time. The original recipe called for refrigerated whole wheat pizza dough. I substituted a package of two ready-made bake-it-yourself crusts. I actually tried two different crusts on two different mornings – first, a thin crust and, the second time with a thicker crust. Both were good. When I followed the cooking directions for the thin crust, the time needed for the baked egg n the recipe made the crust more like a crispy cracker. Good, but not what I had expected. 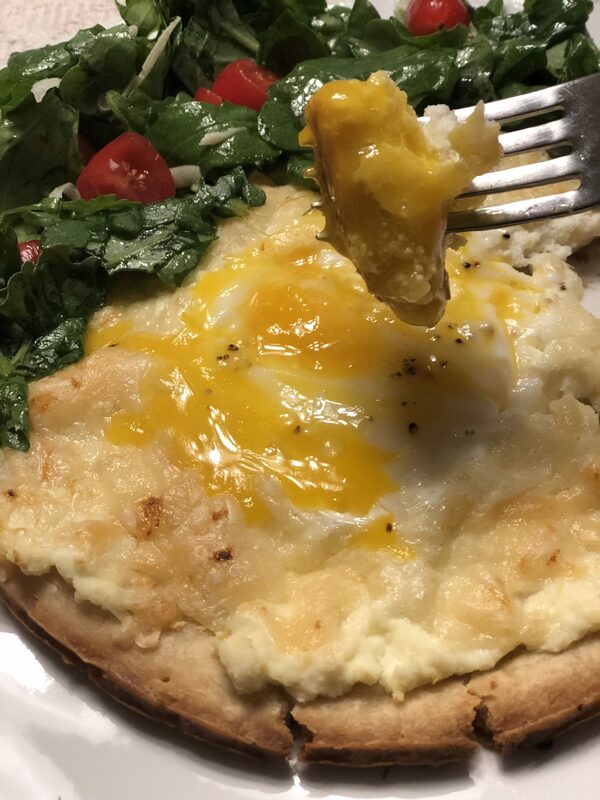 When I used the thicker crust, I baked it for three minutes, turned it over on my sheet pan, added the toppings and baked it 8 minutes to set the egg white and leave the yolk soft the way I like it! The recipe used lemon and oil dressed arugula as a garnish. I like arugula, so I made it a side salad instead of a garnish by adding a few sliced grape tomatoes and a sprinkle of grated parmesan. Next time I make this, I’ll sprinkle some crisp crumbled bacon or pancetta on top. Play with your food and make it yours! Below is the original recipe for four servings from Cooking Light Magazine. It divides in to two or one serving easily. Let dough stand at room temperature for 30 minutes. Divide dough into 4 pieces. Place a pizza stone or large baking sheet in oven; preheat to 450º with stone or baking sheet in place as oven heats. On a lightly floured surface, roll each piece of dough into a 7-inch circle. pierce liberally with a fork. Arrange two dough circles on the hot pizza stone or sheet pan and bake for 3 minutes. Remove from oven and flip so cooked side is up. Repeat with remaining two dough circles. Depending on the size of your stone or pan and your oven, you may need to baked two pizzas at a time instead of all four at once. Stir together ricotta cheese and lemon zest. Divide ricotta evenly among cooked sides of dough circles, sprinkle evenly with 1/8 tsp salt and 1/8 tsp pepper. (I question 1/8 tsp seasoning on 4 pizzas and used a light pinch of salt and pepper on each one after adding the egg as instructed below.) 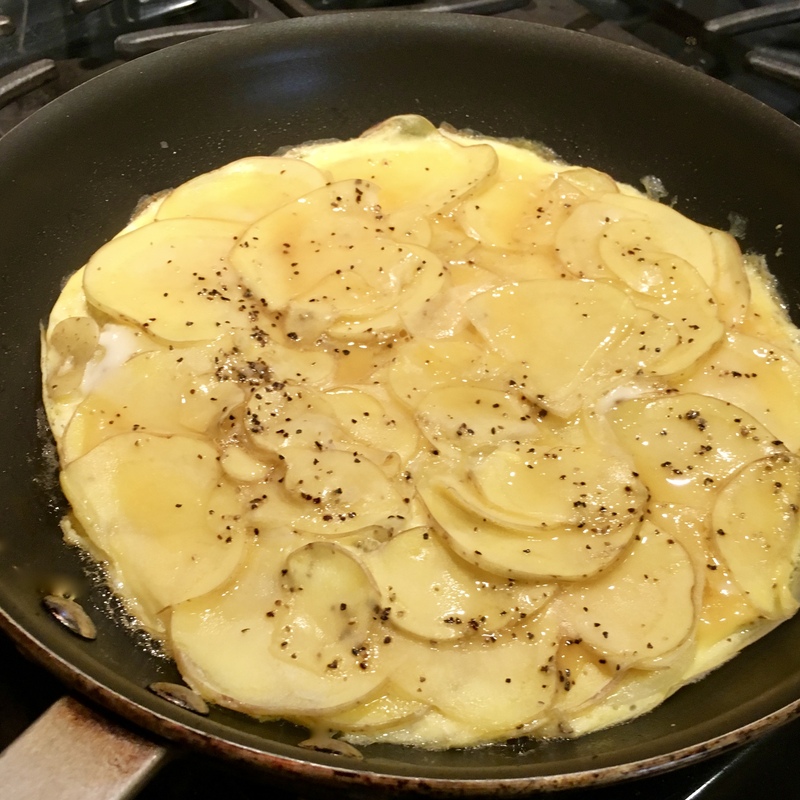 Top each circle with 1 egg and 1 Tbsp parmesan. Bake at 450º until whites are set and yolk is still a little runny. While pizzas bake, Whisk together oil, juice, and remaining salt and pepper I (or to taste as I did!). Toss arugula in dressing. Remove pizzas from oven, plate and top with 1 cup dressed arugula. It has been a while since I’ve posted. That’s because it has been a while since I’ve cooked anything exciting that would work under the New Season goal of recipes for one or two. Browsing through the cookbooks on Amazon, one day, I found several interesting one’s that did two things: 1 – inspire me to try some new adventures in cooking, and 2 – order a few new cookbooks. I tempered that cookbook vice by ordering a couple of e-books and others I bought using the re-sellers available through Amazon at greatly reduced prices plus shipping. As I explore the books and my experiences with the recipes for one or two they hold, I’ll share info about the cookbooks. This morning, I tried the Guy Gourmet Stuffed French Toast. As a rule, I’n not that big a fan of French toast, but it read well and I could reduce the recipe from two servings to one. When I am sharing their recipe, I will provide my interpretation of the original so I hopefully won’t be sued! 4 slices day-old or stale thick bread (I used a bolillo I left on the counter a couple of days and just sliced it in half to make one sandwich. I also use single bolillos to make garlic bread so I won’t eat a whole loaf of French bread by myself. A filling you like – I used sliced apples and bacon. Other possibilities might include a nut spread and banana slices or cream cheese and berries. Be creative. 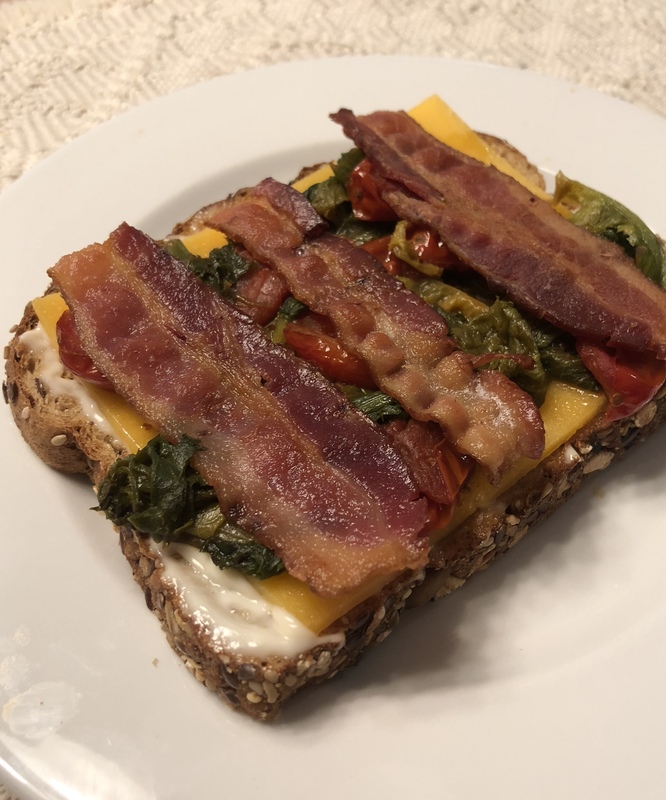 Place topping on two slices of bread and top with the other two slices. Place stacks in batter for two minutes, turning after one minutes so both sides of the bread can absorb and be coated by the batter. ‘Melt the butter in a medium non-stick skillet over medium high heat. Places th sandwiches in the pan and cook until golden brown. Flip the sandwiches so both sides are golden. Serve with a sprinkling of powdered sugar and more of the fruit you used for stuffing the French Toast. 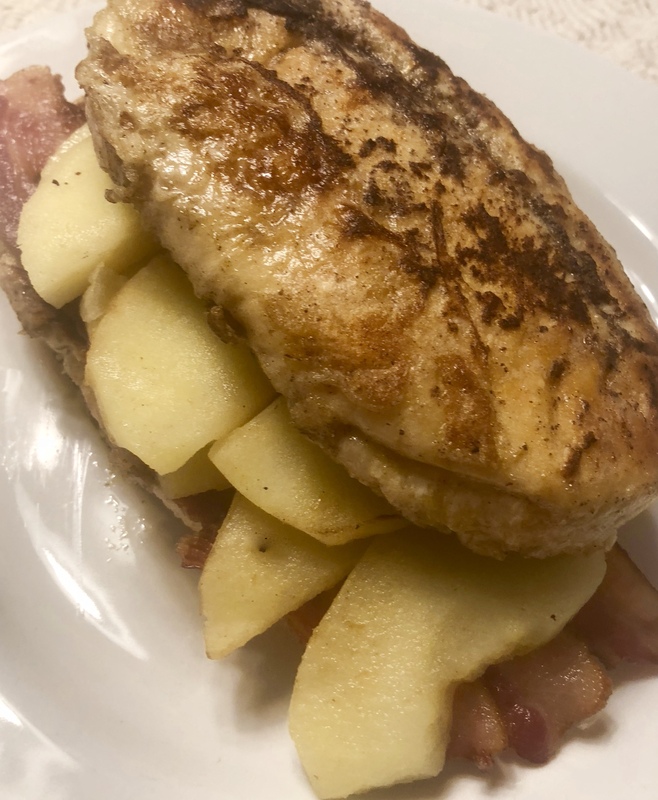 Bacon and Apple Stuffed French Toast sans powered sugar sprinkle. More savory than sweet that way! Shakshouka, a tomato based stew topped with eggs, has been trendy for awhile as breakfast,a brunch or a light supper. 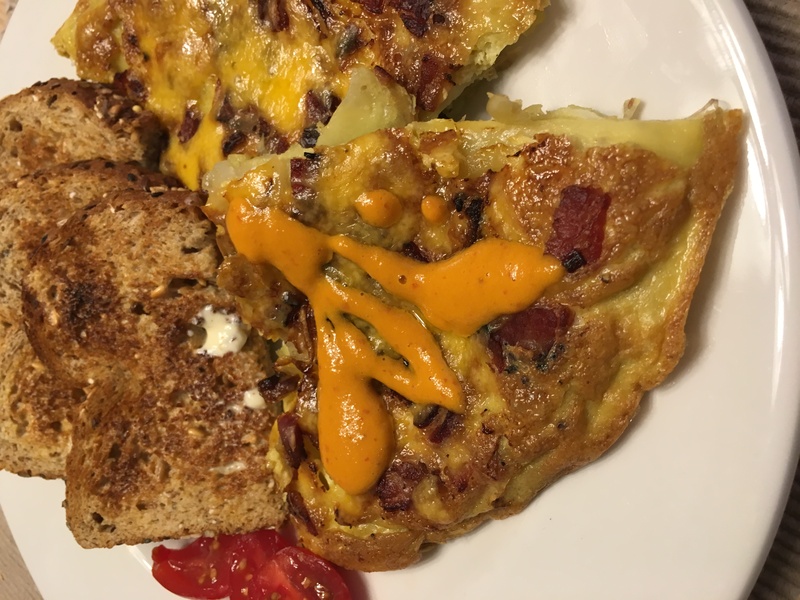 I’ve made and posted traditional shakshouka, green shakshouka and even a leftover corn bread version my daughter named Corn Shouka and enjoyed them all. I was surprised this month when one of my food magazines had multiple shakshouka recipes including one in an advertisement for a diet program’s new marketing plan. There were multiple spelling including the magazine’s Shakshuka version. All that got me shukaed up, so you might find different spellings scattered through here. Yes, it is a terrible pun; just deal with it! 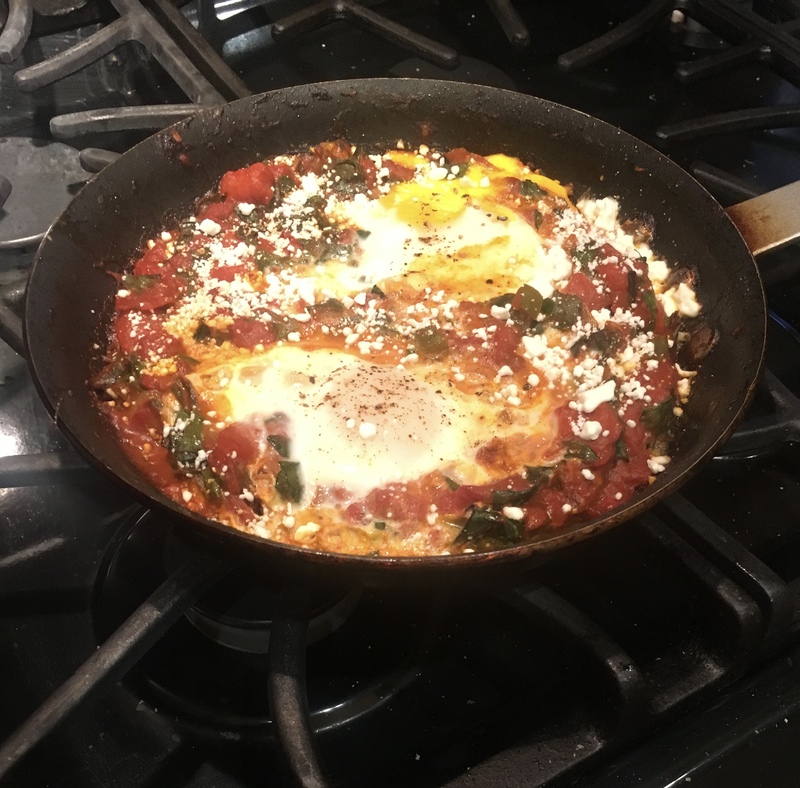 I decided to make shakshuka for breakfast, regardless of the spelling. 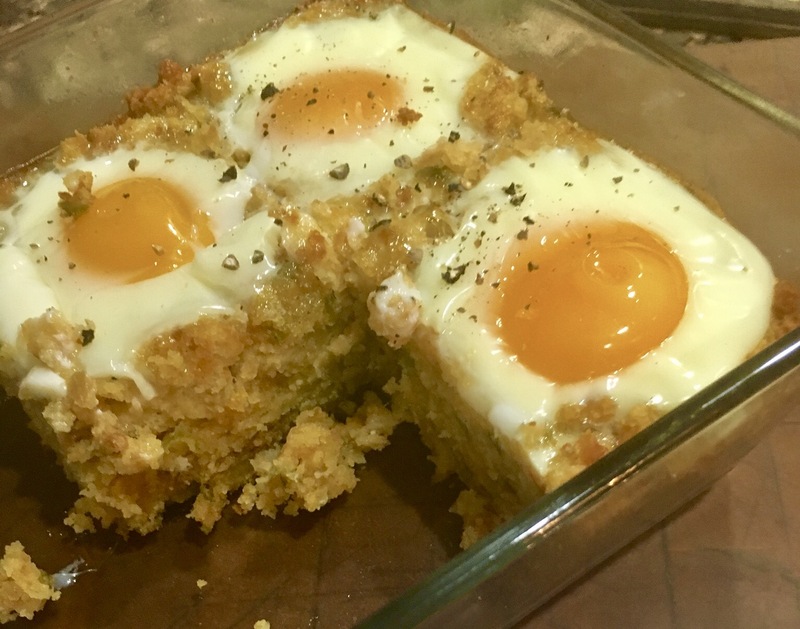 The challenge was that most published recipes make a lot, come calling for a dozen eggs! These days, I’m cooking for one. Reading some of the recipes, I got a feel for ingredients and decided to check out the fridge and pantry to see what I might scavenge for an impromptu shakshouka. You know how I enjoy playing with my food! Shakshouka just out of the often. Drat!!! one egg yolk broke. Not bad, though, for scavenged ingredients! One foil packet (two tablespoons) tomato paste What a great convenience discovery they are! Six packets in a box so you don’t have to throw away most of a can of tomato paste. NOTE: Measurements included in the methods are eye-balled estimates. Trust your experience and instincts and play with that food! Makes two servings. Heat up the broiler in your oven. Add a splash (1 or 2 Tbsp) olive oil to an 8-inch non-stick sauté pan and heat until it begins to shimmer. Use a second-press inexpensive olive oil for this, save your EVOO for salad dressing or for drizzling over the shakshouka at serving. Add chopped onions and bell pepper, about a Tbsp or two of each, and cook until tinder. Lower heat if needed to keep from burning the onion. Add a minced garlic clove or two and let them soften, but not turn golden, stir in the packet of tomato paste, but don’t include the foil. When paste is soften and blended in, add a cup of so of drained diced tomatoes. My pan was filled to about half an inch short of the top. Stir in the salsa (as much for Chile heat as you think you can take) onion, bell pepper and garlic and let it all simmer until reduced and not soggy wet. Add chopped greens to the pan, stir into the mix as the greens wilt and be come tender. Make two wells in the tomato mix and crack an egg into each. When eggs begin to set, transfer pan to the oven under the broiler. Check it frequently and remove the pan when the egg whites are just set. The yolks should be just set. 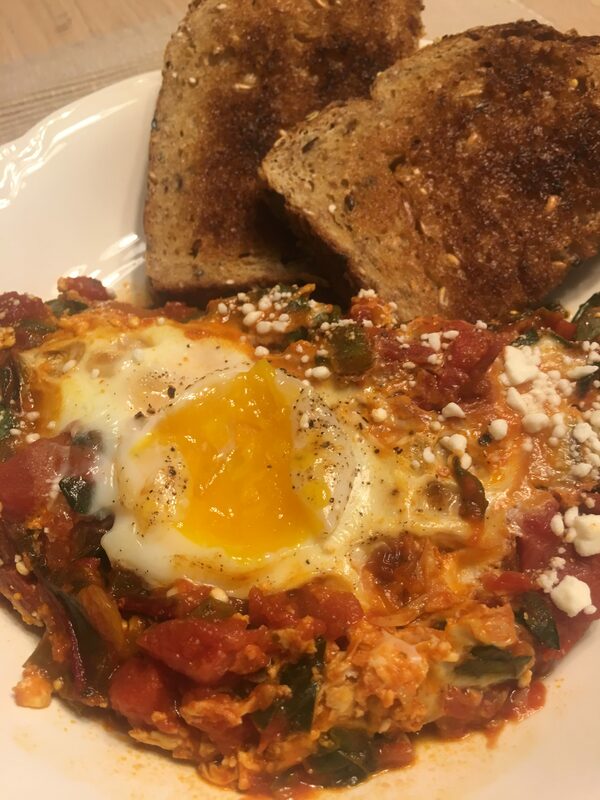 Remove pan from the oven and sprinkle crumbled feta cheese on the tomato mix an eggs. Let it set up a couple of minutes and the cheese soften a little, salt and pepper mix to taste, then plate and enjoy. Half an 8-inch plan and a side of toast was just right for breakfast. The good news is I get to have the second half today! Bulletin: Left overs were more flavorful than the first time around! I may have to experiment making it a day ahead. You can do many more things with sweet potatoes than serve them baked with syrup and marshmallows once a year. And you can tell yourself that sweet potato fries are better for you than French fried potatoes. I suspect you have not tried Sweet Potato Hash Browed Waffles! I saw a recipe and drooled at the photo so I had to try it. The recipe is gluten free, and it is posted below as such. I found that the batter of rice flower, coconut oil and egg did not hold the sweet potatoes together well in my Belgian waffle maker. I used the gluten free items because of a friend’s dietary needs. I’ll make the recipe with regular flour for myself next time. I’ll also use my panini press to cook the sweet potato has because on only have a Belgian waffle maker. 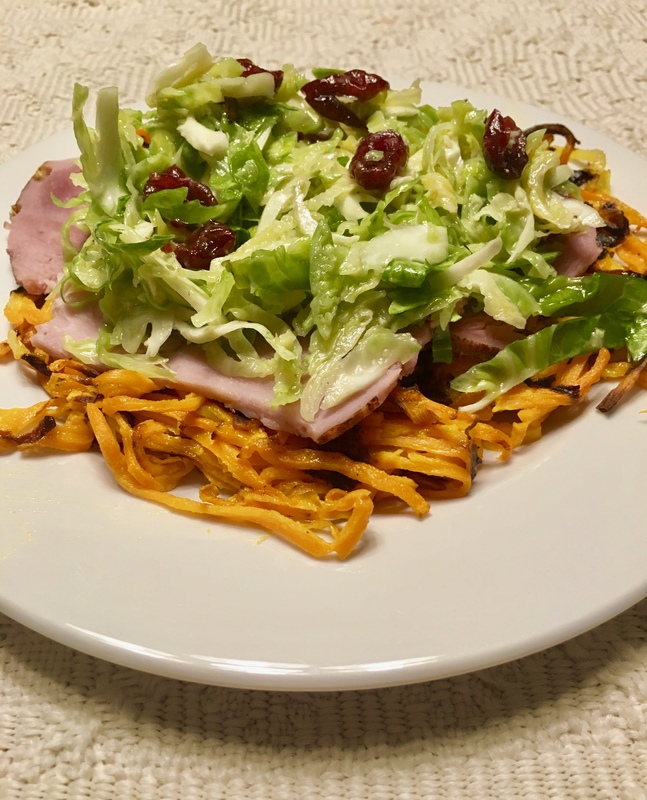 Open-face sweet potato hash brown waffle topped with ham and a Brussels sprout slaw and dried cranberries make an exotic and delicious breakfast! 1 Preheat a waffle iron to high. (I recommend a regular waffle iron rather than a Belgian waffle iron.) Combine the grated sweet potato, onion slices, 1 Tablespoon coconut oil and 1/2 teaspoon of salt in a medium bowl. Grease the waffle iron with coconut oil and place 1-1/2 cuts of the sweet potato mixture in the center of the waffle iron, spread the mixture to create a 6-inch square. Close the waffle iron and cook until browned and tender – about 13 minutes. Remove the waffled sweet potato hash and remove and repeat the procedure until four waffles have been made. 2. Whisk together the oil, vinegar, mustard, maple syrup and remaining 1/2 teaspoon salt in a medium bowl. Add the shaved Brussels sprouts and let stand until the sprouts are tender – about 10 minutes. Fold in the cranberries. 3. Put one waffle on each of 4 plates. Top each with 2 ounces of ham slices and about 2/3 cup Brussels slaw. Note: This slaw is especially flavorful and would be good as a side or topper for most anything. Green Chili cheese grits topped with a poached egg have long been a favorite cool weather breakfast, but, now there’s a new game in town! In the April issue of Bon Appétit, I ran across a technique for Jammy Soft Boiled Eggs served on cheesy grits that I just had to try. No green chili in the grits, but a sprinkling of sautéd scallions and thin-sliced jalapeño saved the day. 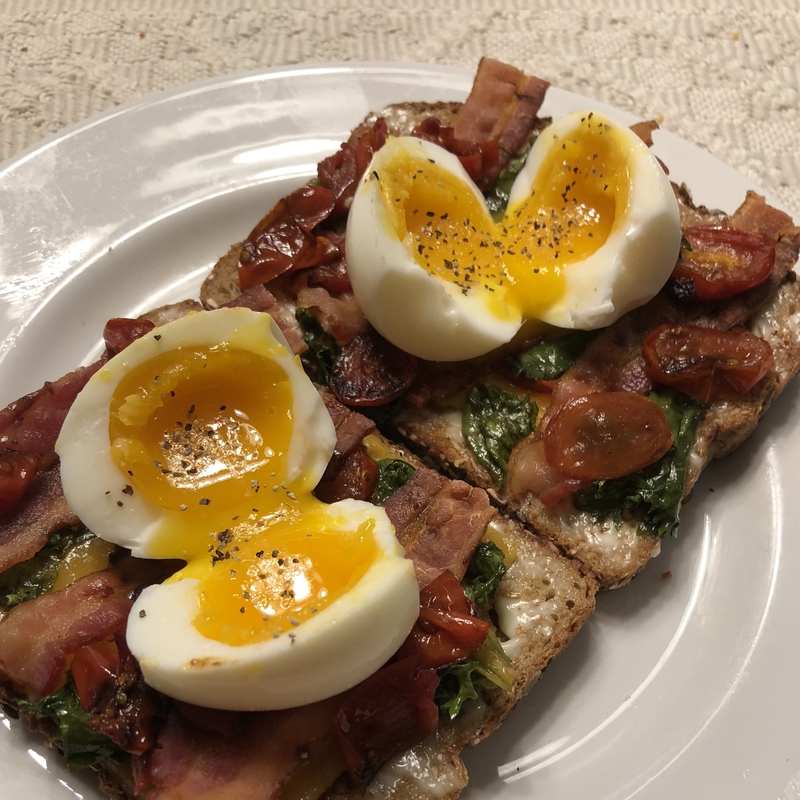 I think the jammy eggs rank right up there with poached eggs for silky delicious yolks just a bit more firm than poached egg yolks. Cheesy grits topped by jammy eggs and crisp scallions and jalapeño. If you don’t know that the ratio of grits to water is 1 to 4, you must be a Yankee. * Slowly pour 1/4 cup grits into 2 cups gently boiling lightly salted water and stir. As grits begin to thicken, reduce temperature and stir occasionally until grits are tender. You might need to add more liquid near the end of cooking. At this stage, I thin it with milk and stir in a tablespoon or so of butter. I don’t use = quick cooking or instant grits, I use the real thing that takes about 25 minutes to cook. It is well worth it to get luscious, smooth and rich flavor. While the grits cook, slice scallions an jalapeño in thin strips. Use an entire bunch of scallions, green and white parts, and two stemmed and seeded chilis, sautéd crisp, the drained on paper towels. To make the jammy eggs, bring a large saucepan of water deep enough to cover eggs to a boil over medium-high. A 2-quart pan should hold 6-8 eggs. Carefully lower eggs into water using a slotted spoon. Cook for EXACTLY 6-1/2 have minutes, then transfer the eggs to a ice bath and chill until the eggs are slightly warm – about 2 minutes. The ice baths stops the cooking and makes the eggs easier to peel. Remove the eggs from the ice bath, peel and slice them. The yolk will be jammy and warm. Dish up the grits, top with slice eggs and sprinkle with crisp scallions and jalapeño. These eggs are so good that I’m searching for things I can serve under them.